As you walk up to to the RT for the first time, there’s no getting away from the fact that this is one big machine. Fully kitted-out as the test bike was with panniers, optional top-box, cylinder covers, heated grips and radio cassette unit, this is a motorbike for travelling serious distances. The size doesn’t diminish as you clamber on board, and on the far side of the tank, framed by the substantial handlebars, you’re faced with a display inside the fairing that should give you all the information you need to get Alpha Centauri, let alone the south coast of France! The seat is wide, well padded, and adjustable for height (805-845mm), but unless you go for the low-seat option (780-820mm), you’d need to be a retired basketball player if you want to be able to get your feet firmly on the ground. How tall is the average German rider? Unfortunately our test bike had the standard seat, and although it was set at the lowest height, my 31-inch inside leg measurement led to some significant moments of uncertainty when bringing its 280-odd kilos of mass to rest. The R1150RT was launched in 2001 to replace the 1100 model that first saw light of day back in 1995, and soon became the yardstick for comfort, agility, and general practicality in a class dominated by capable but heavy machines. The new model gets the uprated boxer engine with an extra 45cc and some more bhp and torque, new wheels, bodywork revisions that include a new headlight, BMW’s latest EVO brakes, and in spite of all this manages to lose 5kg in the process. A short jab of the starter button and the big boxer engine rumbled into life and settled into a steady tick-over. There’s a fast idle lever to aid with those cold early-morning starts, but as this was Summer(!) it was rarely needed during the test. Moving off from BMW’s car park in Thorne, the last thing I wanted to do was to wobble and drop the bike, but I needn’t have worried for as soon as the wheels began to turn, the bulk of the RT magically vanished. After an initial fumble with BMW’s “unique” indicator switches, I was away and up the road to the roundabout and the first surprise. For such a big bike, it changes direction with amazing ease, and tracks true on the chosen line.This could be fun. As I began to get accustomed to the ways of the RT, I started to press on just to see how far it could go. My original plan was to take the motorway to an overnight stop at a friend’s house just north of Sheffield, but I was soon off the dual-carriageway in search of more interesting tarmac. 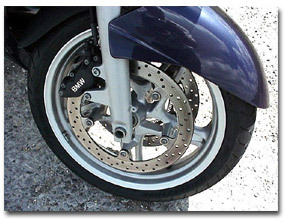 The combination of the Telelever front end and the rear Paralever swing arm gives a superb ride-quality which smooths out nearly all the road irregularities, but at the same time remains firm enough so that you never lose the feel for what those two essential contact patches on the tyres are doing. And you really could throw this thing around. So much so, that on a couple of occasions I got slightly carried away with enthusiasm, and had to make some last minute corrections when I miss-read a corner; but the big RT just tightened the line and settled in with very little effort and no signs of protest. This was seriously good. While all this was going on, the big boxer engine just rumbles on beneath you, using its mountains of torque to pull everything along effortlessly in whatever gear you select. Although it will run right up to the red line at 7,500 rpm, once you get past 6,000 it begins to start sounding a bit frantic but never really stressed. Let’s face it, this isn’t an engine that you bounce off the rev-limiter at each gear change, so relax a bit, short-shift, and watch the horizon being pulled relentlessly towards you. The R1150RT has a new six-speed gearbox, although BMW describe top as an “economy” gear. This is born out by the gear display showing ‘E’ when it’s selected, and the need to change down to fifth, or even fourth, if you want to do some serious overtaking. The gear selection is clunky by Japanese standards but positive, and I never found any false neutrals, although I had problems occasionally getting out of neutral once or twice on the first start of the day. Slightly more disconcerting was the knock from the driveline when rolling on or off the throttle. It never caused any problems, so I put it down to the fact that this was a test bike and had probably had a hard life in it’s first 5,000 miles, if the chips on the front of the fairing were anything to go by! It wasn’t all good though, as by the time I got to my overnight stop, my legs were beginning to feel the strain of straddling the width of the bike, something that didn’t bode well in the comfort stakes. However, let me say that I think this might be more down to something strange with my anatomy rather than a problem with the bike. As I’ve clocked up the miles on the RT since those first few miles, the problem has gone away, so I think it’s more down to my getting old and creaky rather than a flaw with the riding position, although a lower seat height might have helped this old fogey!On the subject of the riding position, everything falls naturally to hand, so BMW have obviously got their ergonomics right. Even those bars, that look impossibly wide and high at first glance, are in just the right place for a relaxed ride, and at the same time provide just the right levels of leverage when you want to up the pace though the twisty bits.There’s a couple of low-slung car-type driving mirrors that provide excellent rearward vision underneath the bars, and a glimpse of the panniers so you can check that your dirty laundry isn’t scattered over the autoroute. They also deflect the airflow away from the bars and make a neat housing for the front indicators. Back on the motorway and in “cruising-mode”, it was time to play with the electrically adjustable windscreen. Now maybe it’s just me again, but try as I may, I just couldn’t find a position that kept the wind off my helmet and stopped it battering my arms. The problem seemed to be down to air flowing round the side of the screen and creating turbulence in the cockpit area, but it never really became so bad that I couldn’t live with it. And when I tried riding two-up, the screen improved dramatically and created a turbulence-free cocoon that received glowing praise from my passenger, as did the well-padded seat, the position of the pillion pegs, and the excellent hand-holds on the carrier rack. The R1150RT has BMW’s latest EVO braking system with twin 320mm front discs, four piston front callipers, sintered pads, electro-hydraulic servo-assistance and integral ABS. This is the most complex system yet fitted to a bike, and it certainly works well, but lacks the feel that I’d like on a bike of this size and weight. They’re also linked front-to-rear, so whether you pull the front lever, stamp on the back pedal, or both, the effect is just the same. BMW claim that it’s 20% more efficient than the old system, which wasn’t bad to begin with, as well as 4.5kg lighter. 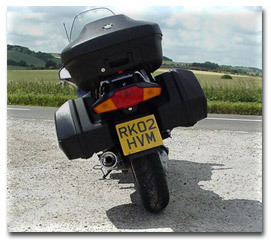 The ABS constantly monitors the load on each wheel, so you’ll always get the best braking balance between the front and rear wheels, whether you’re riding solo, or with a 20-stone mate on the back and the panniers stuffed full of pasties. And if a wheel does the lock then the ABS will trigger within 80msecs.Another feature is that the ABS also monitors the condition of the tail light bulb. If it blows, then a warning light shows on the instrument console, and the stop light is used at reduced intensity, going to full power when you use the brakes. The R1150RT comes with panniers fitted as standard, but if that’s not enough space for you, then you can fit a top box and a tank bag to bring the total capacity to over 130 litres. This is more than enough for most people to do some serious distance touring, even with a pillion along for the ride. There are some nice touches on the bike, like the vents that direct warm air from the oil cooler onto the rider’s hands. And if your hands are still not warm enough, you can switch on the two-position heated grips that were an option fitted to our bike. Even more useful is the knob that adjusts the rear suspension pre-load so that you can set the bike’s attitude correctly, whether you’re riding solo or two up with the luggage loaded to bursting point. And it’s so easy to do. Just a twist of the quarter-turn fastener on the right body panel, pull off the panel and there’s the adjuster. Turn the knob to the appropriate setting, replace the panel and that’s it. Two minutes. And if your headlight still points at low-flying aircraft or illuminates the front mudguard, there’s another knob next to the main instruments that moves the beam up and down. 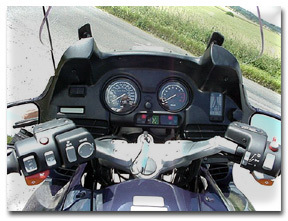 Mind you, it would be better if this was placed on the left, so that you could get to it without stretching across or taking your right hand off the throttle. One point on the headlight, it really is first class. Dip beam will easily illuminate all three lanes of the motorway for safe 80mph riding, and when you add main beam then 110mph-plus is no problem. There’s also a couple of 12V DC accessory sockets that can be used to power an intercom system, recharge your mobile phone, or run anything else that you need while touring. Our test bike came with the radio cassette option fitted, but at a cost of £575, its value is questionable. It’s mounted in a small compartment in the left of the front fairing, which could be better used for storing toll tickets, loose change and the like. You need to use the ignition key to unlock the lid and switch it on and off, which is out of the question when on the move. 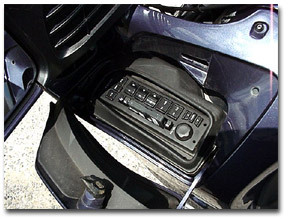 You get twin speakers mounted inside the front fairing and volume, channel seek and mute controls mounted on the left bar, but nothing to control the tape player or switch between the cassette and the radio. 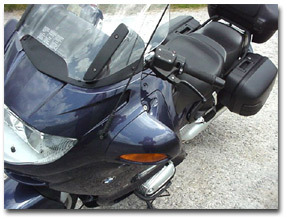 Using the speakers when riding is a bit anti-social and useless over about 80 mph. A better way to use the money would be to fit something like an Autocom intercom and plug a Walkman into it. And it would be around £100 cheaper. If the standard RT is not enough for you, BMW can factory-fit heated grips, dual-tone horns and a radio/cassette. And if you want more, then your dealer can supply topboxes, including one with twin brake lights, innerbags for the cases, a Thatcham alarm, intercom, a carbon rear hugger and Komfi seats. The bike comes a full 2 year unlimited mileage warranty which includes Europe-wide breakdown cover with transportation, hotel accommodation, replacement vehicle and taxi services. The great thing about the RT is that it’s such a neutral and easy bike to ride. The handling will surprise most people who normally associate big tourers with barge-like characteristics, and it’s versatility means that there’s not a lot it can’t do – although I’d think twice about commuting! This is a bike that can be most things for most people, but it’s forte is most certainly clocking up big mileages. And you have the reassurance of BMW’s legendary support and service backup. On the R1150RT, you (and your pillion) will not only get there in style and comfort, but at the same time you’ll have a bike that can give you some serious fun on the twisties. This is a BMW that doesn’t come with a pipe and slippers! 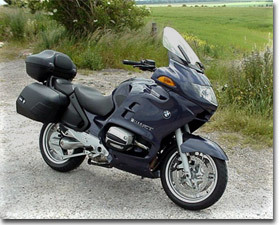 Pay a visit to the BMW website at www.bmw-motorrad.co.uk for more information on the R1150RT. Air/Oil-cooled 1130cc, 8v flat twin “Boxer” four-stroke.